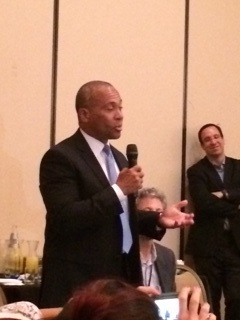 Many of us have long recognized Governor Deval Patrick as a leader. After participating in the Governor’s Trade Mission to Israel last week, it is clear that he is much more than that – he is a visionary statesman. The Governor had a clear mission for this trip: expand opportunities for economic development and job creation in the Bay State, while showcasing the state’s innovation economy and key technology and life-science sectors. At every turn, Gov. Patrick was the “salesleader in chief” for Massachusetts. He encouraged Israeli companies to locate U.S. offices here, supported partnerships between Massachusetts and Israeli universities (two were announced last week alone), provided a path for foreign investment in the state, and worked tirelessly to bring Massachusetts and Israeli innovators together. This trade mission wasn’t initiated for political or feel-good reasons. The research is clear – Israeli-anchored companies directly contribute more than $6 billion a year to the state’s economy, and support close to 7,000 Massachusetts jobs. The indirect support to the state’s economy is even more stunning, contributing close to $12 billion in revenue and supporting more than 23,000 jobs. Mass-Israel revenue is growing at 12.6 percent, three times faster than the state’s overall economy. Most of the state’s economic growth, which is 2.5 times the U.S. average, comes from innovation sectors such as biotech, life sciences, clean tech, EdTech, and other digital technologies. Continued growth in these sectors will add jobs and investment for the state. I joined the mission representing Cengage Learning, one of the state’s newest headquartered companies. Cengage moved its HQ to Boston to take advantage of the state’s innovation economy, deep talent pool, and growing EdTech industry. We were honored to be invited to participate – and both impressed and inspired by the EdTech and other innovations that we saw in Israel. While in Israel, the Yitzhak Rabin Center publicly honored Gov. Patrick – and, indeed, all of us – by naming a room for him. The plaque reads: “Dedicated in honor of the leadership and support of Governor Deval L. Patrick and the people of the Commonwealth of Massachusetts.” This incredible museum showcases Yitzhak Rabin’s life, with the formation of the State of Israel as the backdrop. The Governor’s comments at this important recognition were emotional and moving. With this personal connection, the Rabin Center is a must-see stop for any Massachusetts school, mission, or personal trip to Israel. It’s not often that voters can be proud of their elected officials, but Gov. Patrick rightfully deserves a place of strong pride from his constituents. By cultivating ties with Israel, the “start-up nation,” residents of Massachusetts have a great deal to gain. Gov. Patrick recognizes that a strong relationship with Israel is in the interest of both parties – and, most importantly, gives our state an important advantage in today’s fast-moving and global innovation economy – something that cannot be easily replicated by other countries. Governor Patrick is to be commended for the vision and leadership that he continues to demonstrate, and for his ongoing commitment to a strong and fruitful relationship with Israel. Josef Blumenfeld is the Senior Vice President of Corporate Affairs for Cengage Learning, a nearly $2 billion global education company that recently relocated its headquarters from the NYC-metro area to Boston. Follow him on Twitter @JosefBlumenfeld.